$400 a month? $554 a month?!? When I set out to research how much medical answering services cost, I was a bit shocked by what I found. The cheapest price I came across for a service that could at least spell “HIPAA” correctly was $65 per month, and most of them were closer to $200 or more. This surprised me because the core functionality of a medical answering service is pretty simple: take a verbal message from whoever is calling and relay it to a covering doctor in some text format. I’m an emergency medicine physician, so I’m always calling other doctors’ offices outside of business hours and getting their answering services. I’ve interacted with hundreds or maybe thousands of them by this point, covering surgical clinics, primary care groups, psychiatry practices, and all manner of other specialties. You name it, I’ve called it, and the answering services are all about the same from the caller side. Yes, Spruce can easily and painlessly replace your medical answering service. And save you money. I’m biased, but I promise it makes sense, so hear me out. We built Spruce with powerful, flexible telephony and messaging features so that healthcare organizations could run their entire operations on the platform, coordinating teams and modernizing both in-person and telemedicine care. We weren’t designing it to be used as a simple answering service, but it turns out to fit that bill perfectly. It’s kind of like how memory foam was invented by NASA for aircraft safety but I mostly use it to make my mattress more comfortable. Make a provider account on Spruce. We’ll give you a new second phone number right after you sign up, and we can even provision you multiple numbers, too, if you want; the sky is the limit. Then, install the Spruce app on your iPhone or Android device, and you’ll be able to make and receive calls from your new number. Any voicemails you get will be stored permanently and securely, and they’ll also be transcribed right in the app in a HIPAA-compliant way. You now have a true second phone line for medical use. Use Spruce to invite your teammates aboard. You’ll all have access to the same inbox, and everybody will be able to make calls from your new number and see messages and transcriptions for every patient. You’ll also be able to message each other within a patient thread to coordinate care behind the scenes. Now you have a second phone line that you can seamlessly share with your whole group! Each team member can set their own notification preferences independently. Do you want to get push notifications for every patient call or message? Just some patients? No patients at all? You can set up Spruce however you want. If you’re on call, then you can leave your notifications on. If it’s your night or weekend off, then you can mute everything. Spruce lets you flexibly handle incoming calls. You can have any incoming call ring multiple phones at once. Or you can set all incoming calls to go directly to voicemail, saving you bothersome rings. A custom voicemail greeting can explain to your patients that they should leave a message and that your team will get it, even after hours. Spruce also supports an “urgent” option for your callers, if you choose to enable it, letting you know when a patient really thinks that something needs attention. You can change these call settings any time you want and as many times as you want, giving you complete control. Give your patients your new number and say goodbye to your answering service. After the four steps above, you’ll be ready to use Spruce as your answering service. 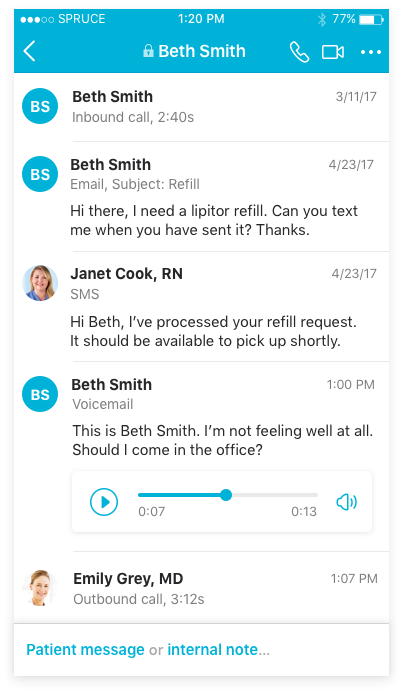 When a patient calls, they’ll leave a voicemail and then Spruce will let you know when both the message and its transcription are ready for your attention. Ring preferences and notification settings will make sure that only the relevant people on your team are looped in, and you can cancel your expensive answering service. Spruce can be a simple drop-in replacement for your existing answering service, but its powerful feature set means that it also has many benefits over a traditional answering service. On Spruce, your whole team collaborates over a shared inbox of patient communication threads. Incoming messages (voicemails, texts, secure messages; everything) are stored securely and permanently. This means that you can log on Monday morning and see everything that your covering colleague dealt with over the weekend on all of your patients. There won’t be any question of how to coordinate over messages from an answering service because everything will automatically be in one unified place. We’ve spent this whole article talking about patient calls, since those are all that a typical answering service will handle. However, Spruce supports nearly any type of communication channel, including SMS texts, secure messages, phone calls, email, and video telemedicine. 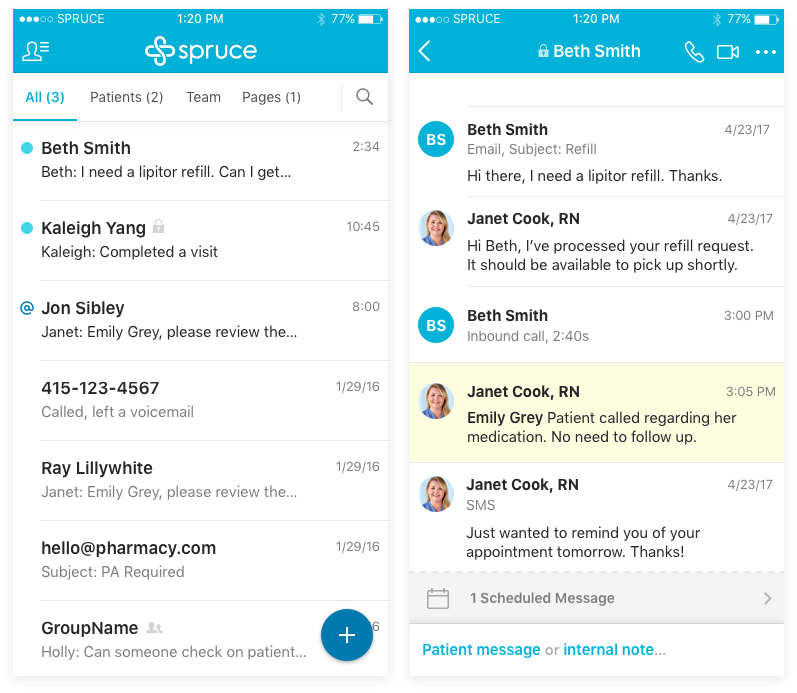 With Spruce, you can tell your patients to simply text their concerns to you, when appropriate, leveraging the numerous efficiencies of avoiding phone calls. Or your covering providers can resolve small problems via telemedicine, saving unpleasant and expensive ER trips. Using Spruce as your answering service can actually reduce your need for an answering service! This may sound obvious, but many pure answering services charge extra for night, weekend, and holiday coverage. That won’t be an issue with Spruce. We’ve engineered Spruce to be a simple part of any HIPAA-compliant workflow. We’ll sign a business associate agreement (BAA) with you, and we have a deep understanding of the privacy and security needs of medical professionals. We’re a medical company first and foremost, and we have been one for years, so crucial topics like industry regulation are not just an afterthought for us. Using Spruce as your medical answering service entails a few changes from a typical answering service. I think most of them are actually changes for the better, but it won’t be a perfect solution for everyone, so let’s examine a few potential issues you might be seeing. This one is easy. If you’re the covering provider, you can set your notifications to alert you for every incoming patient call. The downside of this is that you’ll be getting notifications for things that are not urgent and for which your previous answering service did not bother you. To fix this, you can make use of Spruce’s “urgent” menu option and let your patients indicate that their call needs your after-hours attention. If you turn off your regular Spruce notifications, then you’ll only receive text message alerts for urgent messages, which is effectively the same process as with a standard answering service. Both anecdotal and research evidence suggests that patients will be much more judicious with this power than you might expect if you haven’t tried it before. Spruce will let you selectively answer calls. Patient names will display on the caller ID for your shared second line, so you can choose important calls to pick up, if you want. You can use the voicemail greeting to explain the process. Use your custom voicemail greeting to explain that voicemails will be checked and urgent matters responded to, even after-hours. What is the live human actually accomplishing in an answering service? I think about this every time I call another physician’s answering service. The person on the other end of the line is pleasant, but they aren’t doing anything apart from taking my message, roughly assessing its urgency, and passing it on to the covering doctor. This person’s time is the major reason that answering services are expensive, though, so is it really worth it? For speed and security, Spruce uses automated transcription, and I think it works quite well. It is not as good as if a medically trained human were transcribing the messages for you, but it might actually be better than most non-medical attendants at a typical answering service. Furthermore, if the transcription ever seems inadequate, the original voicemail file will always be there permanently, so you won’t miss anything that your patient wanted to communicate. Spruce can work fantastically as a medical answering service, and I think you might even like it better than what you’re currently using. Expensive, single-purpose answering services were necessary in the past, but smartphones and powerful, cloud-based telephony (like we have in Spruce!) are changing the game. Get in touch with us for a demo, and we can show you exactly how you can ditch your old answering service and be happier for it. Want to improve your medical answering service and save money? Learn more about how practices are using Spruce as an answering service to get rid of unnecessary expenses and to deliver better care that patients love.